There’s only a few days to go before Father Christmas does his rounds again. During this time, we’ve no doubt you’ll be busy with plenty of family gatherings. After all, what is Christmas for if not to get your friends and family around the dinner table to enjoy the festivities? The thought of entertaining guests can be stressful, especially if you’ve not decorated your home for a few years. However, getting your house ready for all of these impromptu visits is easy with Solent, and you’ll be amazed at just how much extra confidence you’ll get from rejuvenating your interior design. Our stunning ranges of ceiling fans and easy-to-assemble wall and pedestal fans make home decorating a doddle. So don’t get caught in the Christmas rush and make sure your home is ready to make a statement. 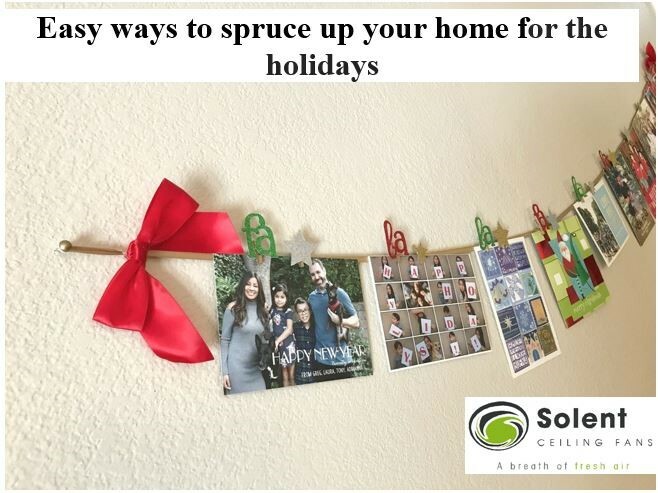 Here are a few tips to help you get your home ready for the festive season. By now, you need to at least have an idea of what fan you would want in your home this December. If you’re not already familiar with our fan ranges, now’s the time to get acquainted with it. You will be amazed by our choices of colours and finishes and the variety of options available to you. Because our fans are priced competitively, you can quite feasibly decorate two or three rooms in the build-up to Christmas. Think about which rooms you’re going to use the most over the festive period and focus on them. You want your friends or family to have a great night’s sleep, and adding a ceiling fan to improve their comfort levels can make all the difference. Organising your schedule and allowing sufficient time for all of your home improvements is crucial. Choosing and settling on your fan range means that half the battle has been won. All Solent fans carry a 3 year warranty given that the ceiling fan is installed by a reputable electrician, so make a mental note of this critical point. Metallic shades can really give your home a luxurious look. It’s a popular choice all year round, but particularly so in the colder months. Sparkling brighter than the star on top of your tree, our rose gold Brushed Aluminium fan is bound to work alongside the metallic accents in your seasonal decorations.